In a town with so many good value budget options, you still can’t go wrong with Khamphone Guesthouse, a long standing quiet and clean choice. Average rating 7.2 from 8 reviews. Khamphone is now comprised of three buildings: two adjacent houses and one across the street. The clean, cheerful rooms have firm beds, a table, chair, minimal decoration and screened windows you can open for fresh air. Some newer rooms also have a TV and mini-fridge. All rooms have WiFi, attached bathrooms with hot water shower and Western toilet. The location at the south end of town is far enough from the centre of town that it’s quiet at night. Each building has a communal balcony area with tables and chairs, and extra services are available like laundry, drinks, tours, bike rentals and onward transportation. Khamphone’s air-con rooms are the same price as Nana Guesthouse, but here the rooms here are well-maintained, far cleaner and fresher. Whether you want fan or air-con, this is a great choice. 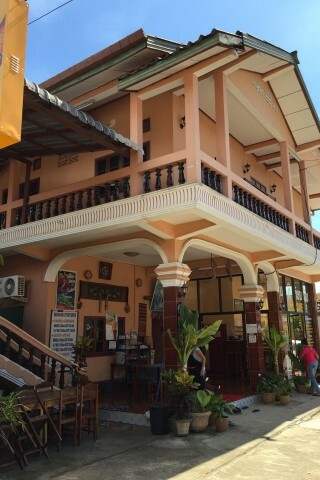 Khamphone Guesthouse is located just off the main road not far from Pan’s Place, beside Kianethong Guesthouse. Check rates at Khamphone Guesthouse on Booking.com.